About midday I headed over to my “office” (aka Bar Britanico) to edit a manuscript. At one point I start hearing a guy speaking in English at the table behind me. That’s not very unusual considering all the tourists in San Telmo. The guy was conversing with a few others about various cinema topics. Somewhere along the way I heard the terms “moral ambiguity” and “acting”. Eventually I turned around and realized that it was Francis Ford Coppola. Of course, everyone here in Buenos Aires knows that Coppola has been hanging around the Argentine capital writing a screenplay, getting robbed, and preparing for his new movie Tetro. I figured that I eventually would have my requisite Coppola sighting. Enter Vincent Gallo: I was sitting by the door and couldn’t help but notice when a bearded, scruffy guy in black t-shirt swaggered in with an appearance that proclaimed “Yes, I am an actor” and joined Coppola’s table. Over the next hour I kept hearing snippets of conversation between Coppola and Gallo while the other 4 people at their table (and everyone at surrounding tables) listened. Gallo, who has a very loud voice, asked Coppola about Dracula and Gary Oldman. Coppola threw in Uma Thurman’s name. Gallo tossed out Christina Ricci and Buffalo 66, and so forth. Coppola returned with a “Brando said,” which was drowned out by the noise. Gallo asked again, and Coppola repeated, “Brando said….”. A man walked by the window with a llama. Where are we, Peru? I never heard what Brando said. A block away, on my way home from Britanico, I’m almost knocked down as I cross Av Caseros by a young, dark-skinned boy being chased by a policeman swinging a nightstick. I’m about to head out of town for a week without Internet and computer, yeah! 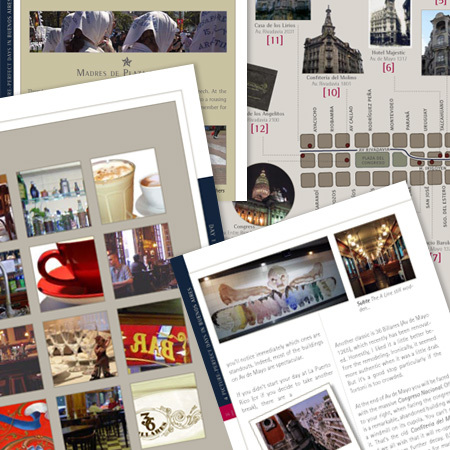 But before I leave I want to mention the first title in the Walking Buenos Aires book series: 4 Picture-Perfect Days in Buenos Aires. Later titles in the series, coming out about one new title every two or three months, will focus more in-depth on different characteristics of the city. To stay updated with announcements about this series of books, you can head over to walkingbuenosaires.com and leave your e-mail address. Many of you already have done so and Thanks! These days I’m busy editing a book on architectural photography. To get away from the computer for a while I often take a manuscript to a cafe. Today it was El Hipopótamo. As I sat there, during a break from reading and editing, I turned the camera towards the window and Bar Británico across Defensa street. Here’s a photo that I’ve been intending to put up for a long time. Actually, I see that I took this photo last April! I’m really behind on my blogging. Obviously, the store specializes in selling pens. If you like stores with painted shutters, you need to get out and about early in the day. Or, head down to La Boca for things you see only on a Sunday. Maybe it’s just me, but I find something quite beautiful about the cracked, old sidewalk tiles. While on last week’s walk down Billinghurst I came across this bookstore located on the ground floor of an older building. Somehow, it seemed ironic that just across the street another old house had been demolished. Yesterday while walking down Tacuari just after a brief rain shower, I saw this photograph lying on the sidewalk. My first assumption was that someone had lost a photo. No name on the back, just the numbers “150%”. But there were also a number of paper scraps strewn along that block of Tacuari. Oddly parked along the curb were close to a dozen cars with emblems of the truck drivers union of Tierra del Fuego.